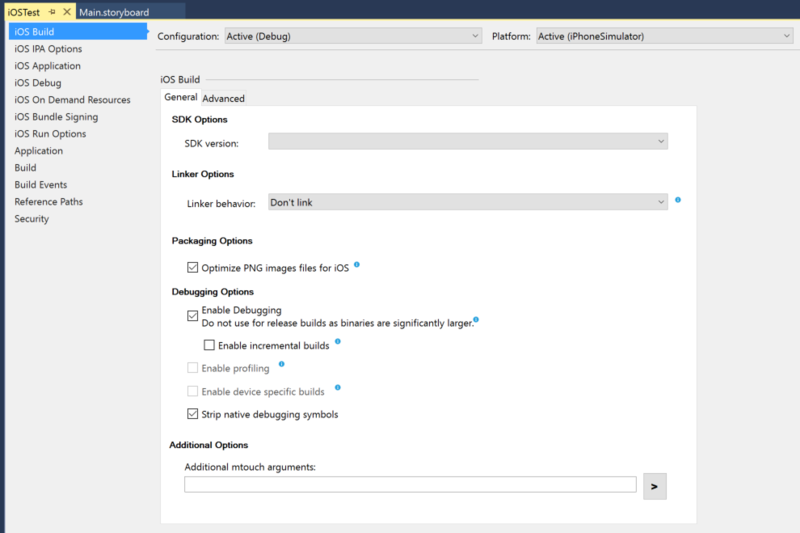 When building your application, Visual Studio for Mac or Visual Studio calls a tool called mtouch that includes a linker for managed code. It is used to remove from the class libraries the features that the application is not using. The goal is to reduce the size of the application, which will ship with only the necessary bits. The linker uses static analysis to determine the different code paths that your application is susceptible to follow. It's a bit heavy as it has to go through every detail of each assembly, to make sure that nothing discoverable is removed. It is not enabled by default on the simulator builds to speed up the build time while debugging. However since it produces smaller applications it can speed up AOT compilation and uploading to the device, all devices (Release) builds are using the linker by default. As the linker is a static tool, it can not mark for inclusion types and methods that are called through reflection, or dynamically instantiated. Several options exists to workaround this limitation. The linking process can be customized via the linker behavior dropdown in the Project Properties in Visual Studio. Follow the instructions below to change the linking options. Disabling linking will make sure that no assemblies are modified. For performance reasons this is the default setting when your IDE targets for the iOS simulator. For devices builds this should only be used as a workaround whenever the linker contains a bug that prevents your application to run. If your application only works with -nolink, please submit a bug report. This corresponds to the -nolink option when using the command-line tool mtouch. In this mode, the linker will leave your assemblies untouched, and will reduce the size of the SDK assemblies (i.e. what's shipped with Xamarin.iOS) by removing everything that your application doesn't use. This is the default setting when your IDE targets iOS devices. This is the most simple option, as it does not require any change in your code. The difference with linking everything is that the linker can not perform a few optimizations in this mode, so it's a trade-off between the work needed to link everything and the final application size. This correspond to the -linksdk option when using the command-line tool mtouch. When linking everything, the linker can use the whole set of its optimizations to make the application as small as possible. It will modify user code, which may break whenever the code uses features in a way that the linker's static analysis cannot detect. In such cases, e.g. webservices, reflection, or serialization, some adjustements might be required in your application to link everything. This correspond to the -linkall option when using the command-line tool mtouch. When you use the linker it will sometimes will remove code that you might have called dynamically, even indirectly. To cover those cases the linker provides a few features and options to allow you greater control on its actions. When you use the linker it can sometimes remove code that you might have called dynamically either using System.Reflection.MemberInfo.Invoke, or by exporting your methods to Objective-C using the [Export] attribute and then invoking the selector manually. In those cases, you can instruct the linker to consider either entire classes to be used or individual members to be preserved by applying the [Xamarin.iOS.Foundation.Preserve] attribute either at the class-level or the member-level. Every member that is not statically linked by the application is subject to be removed. This attribute is hence used to mark members that are not statically referenced, but that are still needed by your application. For instance, if you instantiate types dynamically, you may want to preserve the default constructor of your types. If you use XML serialization, you may want to preserve the properties of your types. You can apply this attribute on every member of a type, or on the type itself. If you want to preserve the whole type, you can use the syntax [Preserve (AllMembers = true)] on the type. 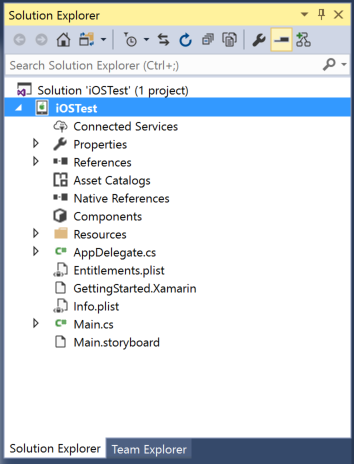 If you do not want to take a dependency on the Xamarin libraries -for example, say that you are building a cross platform portable class library (PCL) - you can still use this attribute. It does not really matter in which namespace this is defined, the linker looks this attribute by type name. It is possible to specify assemblies that should be excluded from the linker process, while allowing other assemblies to be linked normally. This is helpful if using [Preserve] on some assemblies is impossible (e.g. 3rd party code) or as a temporary workaround for a bug. This correspond to the --linkskip option when using the command-line tool mtouch. There is no user interface to use this option but it can be provided in the Visual Studio for Mac Project Options dialog or the Visual Studio project Properties pane, within the Additional mtouch arguments text field. (E.g. --linkskip=mscorlib would not link mscorlib.dll but would link other assemblies in the solution). The linker will remove code that is very unlikely to be used on devices, e.g. unsupported or disallowed. In rare occasion it is possible that an application or library depends on this (working or not) code. 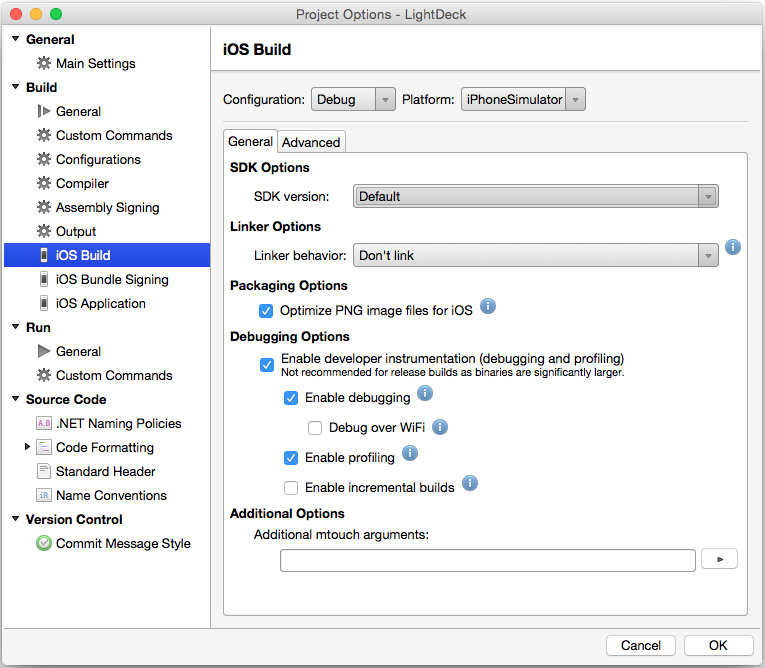 Since Xamarin.iOS 5.0.1 the linker can be instructed to skip this optimization. This correspond to the -nolinkaway option when using the command-line tool mtouch. There is no user interface to use this option but it can be provided in the Visual Studio for Mac Project Options dialog or the Visual Studio project Properties pane, within Additional mtouch arguments text field. (E.g. --nolinkaway would not remove the extra code (about 100kb)). Users can select to just link the SDK assemblies, and not do any linking to their code. This also means that any third party libraries that are not part of Xamarin's core SDK will not be linked. This happens typically, because they do not want to manually add [Preserve] attributes to their code. The side effect is that third party libraries will not be linked, and this in general is a good default, as it is not possible to know whether a third party library is linker friendly or not. Follow the instructions for creating a linker configuration file.